Come to London to enjoy the Andrew Lloyd Webber and Tim Rice classic, Joseph and the Amazing Technicolor Dreamcoat at the London Palladium with a Theatre Break next summer. You’ve got to go back 45 years to when Joseph, his coat and his brothers first appeared on the West End stage and this is the first time it has been back since 2007. The multi-award-winning musical, composed by Andrew Lloyd Webber and Tom Rice, is based on the ‘coat of many colours’ narrative from the Bible’s Book of Genesis. Sold into slavery and then imprisoned, Joseph discovers he can interpret dreams – leading him to form a friendship with the Pharaoh. With very little dialogue, the story is told completely through songs from a huge range of genres – from rock and roll to my favourite, calypso. 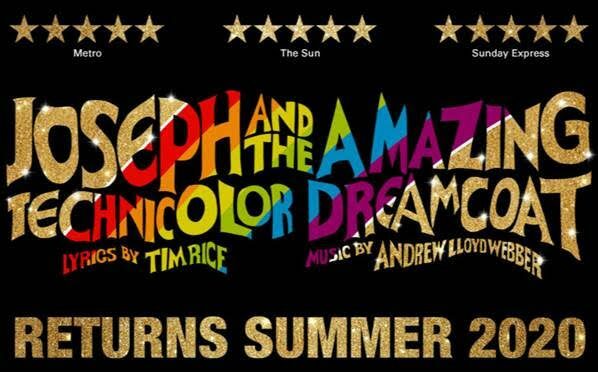 Joseph is at the London Palladium in 2019. You can stay nearby or within easy travelling distance – it is up to you. Theatre Breaks have a range of hotels almost as wide as the range of music in Joseph! Joseph is a great musical for the whole family and with many of our hotels offering family rooms a family theatre break in 2019 is easy to arrange.